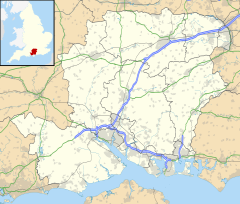 Upper Wield is a village in the East Hampshire district of Hampshire, England. It is in the civil parish of Wield. It is 5.5 miles (8.9 km) west of Alton. The nearest railway station is the restored Medstead & Four Marks station on the Watercress Line, trains from which connect with the nearest national rail station 5.5 miles (8.9 km) to the east, at Alton. This page was last edited on 3 April 2017, at 14:54 (UTC).